Opening this Friday at IFC Center in Manhattan. See details below. With my leg amputated and body riddled with shrapnel wounds and body pulsating from pain, late at night I would often talk with another Marine who was also unable to sleep. We were on the same ward in Bethesda Naval Hospital, but his Vietnam War wounds had healed several months ago, and he was growing increasingly impatient to return to the war zone. Surrounded by wounded Marines in agony with ripped-apart bodies and he couldn't wait to get back to the war. "In the Nam," he said quietly not to disturb the Marines trying to sleep, "I was my platoon's M60 machine gunner. Here I just run errands for the nurses." Watching a film last night, I suddenly remembered my forgotten late-night Marine companion from 42 years ago. The Oath, the second documentary in a proposed trilogy on the post-9/11 world by award-winning filmmaker Laura Poitras, tells the story of two brothers-in-laws who were former associates of Osama bin Laden. Abu Jandel was a body guard for bin Laden, and Salim Hamdan was the former driver of bin Laden. 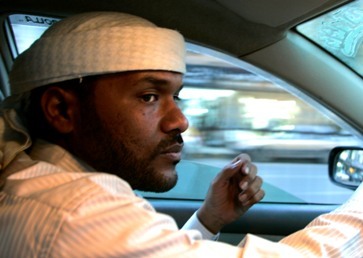 Today Jandel he is taxi driver in Yemen, and until recently Hamdan was a prisoner in Guantanamo. In The Oath, we hear only Salim's written words, words from his prison letters, while the voice that carries this film is Abu's spoken words. And speak he does. The former bodyguard for bin Laden talks rather openly while driving his taxi through the congested streets of Sanaa, Yemen's capital city. The most touching moments, however, are when he communicates with his darling little boy. The most uncomfortable times are when he lectures groups of men about Islamic Jihad. This is when I found Jandel easy to dislike - hubristic and calculating and probably unreliable. Regardless, he is nearly always fascinating, especially when revealing the al Qaeda mentality: alienation from mainstream society combined with a strong sense of victimhood and a heavy dose of romanticism. This is when you can begin to see what leads Arab men to al Qaeda -- actually, leads all young men to every violent, fringe group. Yet, this charismatic, brutish and sensitive man cannot be easily defined. He has an octopus personality. He suffers from persistent guilt for recruiting his brother-in-law into al Qaeda, which landed him 7 years in the Guantanamo prison. He can barely look at Salim Hamdan's wife and kids. Meanwhile, he's fearful that young Islamic extremists -- who believe he is a traitor to the cause -- will assassinate him. At the same time, he seems to be genuine when defending al Qaeda publicly. Finally, as his financial debts mount, Jandel is forced to sell his taxi, which leaves him unemployed. And we begin to see what can lead Arab men back to Al Qaeda. All kinds of young men back to the logic of the gun. What reminded me of my late-night Marine companion from 42 years ago, however, was when the camera suddenly caught in Jandel's eyes the look of sharp pain instantly followed by the appearance of deflated ego. Jandel had begun to speak about the difficulty of adjusting to his reduced status now that is no longer a Jihadist warrior -- and in a split-second, I saw the face of that errand boy Marine at Bethesda Naval Hospital saying he just had to get back to machine gun. Director Poitras has crafted a gripping story free of simplicity and forced conclusions, a fascinating journey into the lives of two former Jihadist warriors -- the imprisoned Salim Hamdan claims, of course, he was never a real Jihadist -- two men who took the al Qaeda oath of war against infidels and today struggle in different worlds outside that oath. Although one is technically free, Jandel seems as much in prison as the face that we never see and the voice we never hear, Hamdan's. Although Salim Hamdan was released at the end of the filming, he refused to participate in the film. We can also assume that his freedom will never be real freedom. Neither man will ever be whole again. War does that -- not just their war, any war. Poitras skillfully alternates between the written words from prison and the spoken words from Yemen, between stark, gorgeous shots of eerie Guantanamo and bustling, colorful Sanaa street scenes. Once united in cause and then through marriage, a divergence sent Salim Hamdan and Abu Jandel into different universes. While the imprisoned Hamdan lives to be free and to return to his family -- at least the latter he does achieve -- Jandel lives in freedom with his family but he is in his prison. War may at times be a liberator on the national level, but on the human level it nearly always enslaves. Well, for those who pay the price for war. The Oath is finely layered with the complexity of regret and yearning, rock certainty torpedoed by deep desire. The Oath is many things, including understanding cut with confliction. It is even a US Marine struggling with a diminished status in America and desperate to return to Vietnam. And suddenly it was not so easy to dislike Abu Jandel. That is The Oath too. The Oath will open at New York's IFC Center on Friday, May 7th, followed by a roll out to select U.S. cities. The IFC is located at 323 Sixth Avenue at West Third Street. The telephone number is (212) 924-7771, and the e-mail address is ifccinfo@ifccenter.com For map and directions to New York's IFC Center, click here.